Here's one view of my table: Chocolate Raspberry Cake, Fresh Fruit Tarts, mini-cupcakes in 3 flavors: Carrot Cake, Gluten-free Coconut Cupcakes with soy-free Coconut Frosting, Coconut Cupcakes with soy-free Chocolate Frosting. This green event took place on Sunday, May 2nd at the David Brower Center in Berkeley. There were 22 tables which included some really great products by young entrepreneurs. I just wish there had been more attendees, even though I had a great time because 9 people I'd invited did come. That meant that a lot of my friends received tarts, pieces of cakes, cupcakes, brownies, cookies during the following week. When Alaine Shrewsbury's vegan bakery was located in Los Angeles, her celebrity customers included Woody Harrelson, Jason Alexander, and Alicia Silverstone. Alexander favored a chocolate-cherry parfait cake; Silverstone — who "doesn't have a sweet tooth" — favored sprouted-millet bread. 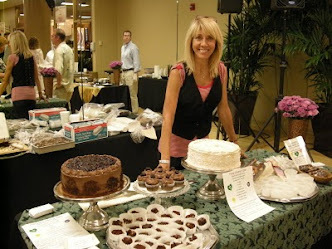 Now Shrewsbury's Green Heart Bakery is in Danville, where her lavish, magazine-pretty, all-organic, and still-vegan artworks can be baked to suit special needs of all kinds: from brown-rice-flour gluten-free triple-coconut and chocolate-raspberry cakes to Xylitol-sweetened diabetic-friendly brownies to agave-sweetened, silken-tofu-frosted wheat-free carrot cake and cheeseless Key lime "cheesecake" and beyond. That is the incredible vegan chef, Kim Brown, who drove from Suisun to see me! She is always a wealth of information.